where the wild things are. no.4. black walnuts. a tough nut to crack. I am definitely into squirreling away Black Walnuts this year! While working in Hudson, New York this past week we stopped to gather a bushel that had fallen from a tree we spotted at the woods edge. 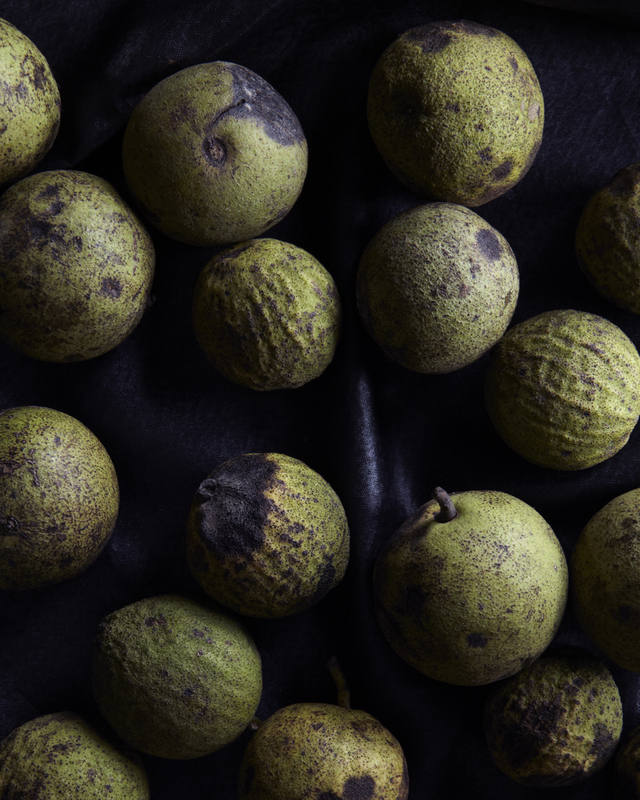 Gathering and cleaning Black Walnuts can be a bit of an ordeal, but totally worth the time.The walnuts can be gathered once they have dropped to the ground. Pick them up when they have a green husk. They can then be laid out to age in a dry spot until the husk turns a yellow brown. At that point the outer husk will come off fairly easily, however if you have any trouble just circle around the husk with a small sharp paring knife. Make sure to wear gloves while removing the husk, as the tannins will stain your fingers. The hull should be removed to allow the walnuts to dry out. If the husk is left on, the heat caused by the decomposition of the hull will change the flavor of the walnut. I do know some people who prefer to leave the nut in the hull for a year or more before removing it because they feel it ages the walnut like a great wine or cheese. Once the nuts are free of the husk it is best to let them sit a month or two to age. Lay them out on newspaper or brown paper bags. The dryer the nut, the easier it will be to remove the nutmeat without damaging it. I leave them to dry for a few months or more in a well-squirreled proofed place! There is much written about the black walnut being that it is a very tough nut crack. You will find many bizarre and unfamiliar suggestions such as driving over it with a car or wearing heavy work boots to crack the shell, however I have found that a small hammer or a vice will do just fine without damaging the meat inside. The black walnut has a distinct taste and smell that is unlike the commercial walnut that most of us are used to. 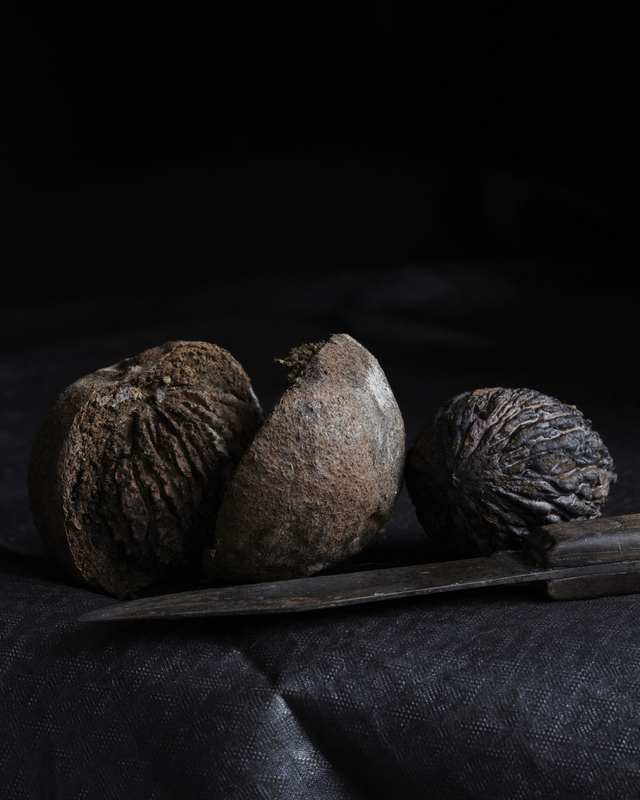 Black Walnuts taste of dirt, mushrooms and wine and smell a tiny bit sour, but I promise they taste delicious! The taste is very earthy and lends an interesting rich flavor to many foods. Use them anywhere you would use walnuts. Recently I made a raw milk panna cotta with a maple and black walnut glaze. I also dropped some into a jar of local honey and served the honey and walnuts with an aged tilsit. Add them to a pesto for an earthiness or to a traditional brownie recipe for an earthy bite. Next year I will try pickling black walnuts which has to be done before the shell starts to harden. Adapted from an Alice Water's recipe from the Chez Panisse Cookbook. Put three tablespoons of cold water in a stainless steel bowl, sprinkle on the gelatin and set aside to soften. Lightly brush the ramekins or vessels you will be using with the almond oil or vegetable oil. Set them aside in the fridge to chill while proceeding with the recipe. Cut the vanilla bean and scrape the inside into a medium sized sauce pan along with the cream, sugar and milk. Bring to a simmer and cook for about a minute. Remove from the heat and let the cream mixture cool, stirring occasionally for ten minutes or so. Pour about one cup or so over the softened gelatin. Stir until the gelatin is completely dissolved, pour it back into the remaining cream mixture and stir well. Strain through a fine mesh sieve and pour into ramekins or vessels. If you are turning the Panna Cotta out of the ramekin, slide a knife around the outside the panna cotta and turn out onto a dish. I choose to leave them in their vessels. shell the walnuts and coarsely chop. Set aside. Put the 1/2 cup of maple syrup in a sauce pan and heat on medium heat until it just simmers. Turn it down to low and cook for 5 minutes to thicken slightly. Spoon the warm maple syrup over the individual panna cotta and add a few pieces of black walnut to each. Serve while the syrup is warm.